Two months before the Metropolitan Museum of Art's Costume Institute show dedicated to Elsa Schiaparelli and Miuccia Prada opens, the New Yorker's Judith Thurman has a lengthy story about the show. It appears Thurman didn't get to speak to Prada for the piece, but she did interview the curators. And perhaps best of all, the piece is accompanied by a gorgeous portfolio of photos by Platon, which showcases some of Prada's and Schiaparelli's most iconic designs. "It is doubtful that the notoriously touchy Schiaparelli would have been happy about sharing a double bill, even with such an illustrious compatriot," writes Thurman, "or that Prada would have submitted to comparison with a contemporary." What Thurman doesn't mention is that Prada is in fact on record as critiquing the Met's curatorial vision for the show. This January, she told reporters, "They are focused on similarities, comparing feather with feather, ethnic with ethnic, but they are not taking into consideration that we are talking about two different eras, and that [Schiaparelli and I] are total opposite. I told them, but they don't care." (The company spokesperson quickly clarified that Prada's griping was just her independent mind: "Mrs. Prada confirmed that she admires the total curatorial independence of the museum to the extent that they almost did not take into consideration her vision.") Thurman does a good job of exploring the similarities, aesthetic and biographical, that make the Schiaparelli/Prada comparison one whose appeal is obvious to everyone (save, perhaps, the two principals). Its subjects were born six decades apart (Schiaparelli in Rome, in 1890; Prada in Milan, in 1949), and they never met, though some of their affinities seem almost genetic. They both had strict Catholic girlhoods in upper-crust families, with traditional expectations for women, and they both took heart from maternal aunts whose feistiness defied the mold. Schiaparelli is the more patrician — her mother descended from the dukes of Tuscany — but her father was a university professor, and so was Prada's. Neither woman set out in life to design clothes, or even learned to sew. They were both ardent rebels and feminists who came of age at moments of ferment in art and politics that ratified their disdain for conformity. Schiaparelli was involved with the Dada movement at its inception in Greenwich Village, after the First World War; Prada was a left-wing graduate student in Milan during the radical upheavals of the nineteen-seventies. 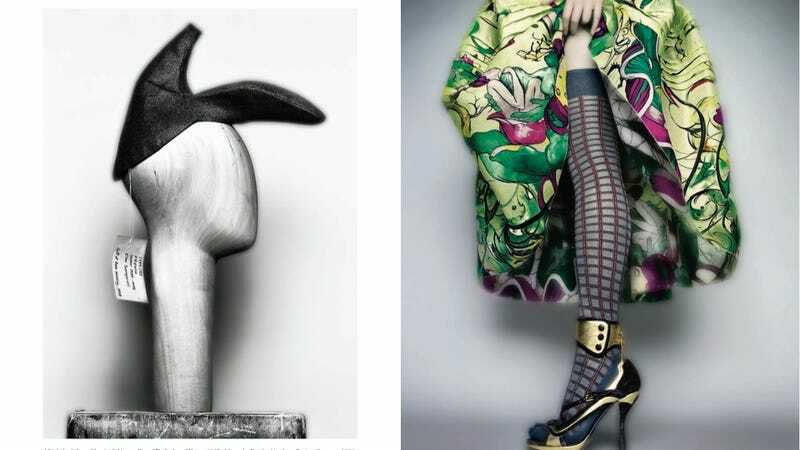 Schiparelli and Prada are also both known for their relationships with contemporary artists — Schiaparelli as a Futurist and Surrealist fellow traveler who collaborated with Dalí, and Prada as one of the most influential private collectors in the world and the director of a huge exhibition space and foundation. And they are both known for their experimental approaches to textiles, with such non-traditional materials as plastic, paper and crochet finding their way into formal wear. Thurman's piece returns again and again to the concept that perhaps best defines the link between the two designers: what is the Met has decided to call "ugly chic." Ugly chic is to fashion what dissonance is to music, or Cubism was to painting: an aesthetic that suggests there are things more valuable than mere beauty. It isn't that Prada undervalues beauty's power — both she and Schiaparelli have dozens of ravishing ensembles in the show. But the old radical, you suspect, resents it as an unearned asset of the one per cent, and the brainy feminist wants you to understand its pathos as a love charm doomed to expire. You shouldn't need it if you love yourself.